Can cancer cells be killed without harming the healthy cells around them? A new clinical trial is testing that hypothesis using a treatment based on the vaccinia virus. Vaccinia has played a huge role in eradicating smallpox but is now taking on a new part in the fight against cancer. Dr. Loren Mell, a radiation oncologist at UCSD Moores Cancer Center, explains how this treatment built on the vaccinia virus backbone may be the key to more effective cancer fighting tools. 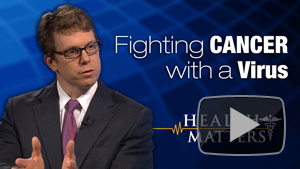 Dr. Mell and host Dr. David Granet discuss this current research and the importance of clinical trails for cancer patients. Dr. Mell is the Principal Investigator of many clinical trials at UCSD and oversees several nationally and industry-funded research grants. Watch Fighting Cancer with a Virus. Browse more programs in the Health Matters series.